We have three new dye sublimation imprintables today. First up is a white gym bag with black cords. It prints beautifully and is sure to be popular with your customers. Then we have two stainless steel 'bowling pin' style Thermos bottles. The bottles have a 500ml capacity and keep drinks hot, or cold, for hours. They are available in white and silver. Finally we have a new style toothbrush holder which replaces our previous range of two part holders. The holders are very competitively priced at just £2.79 for a pack of two! New Vapor Solar t-shirts and dog bandanas! 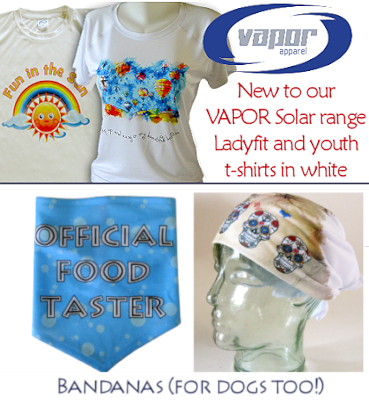 We have just added white ladyfit and youth size t-shirts to our range of Vapor Solar garments. The Vapor Apparel Solar t-shirts are made in a 140 gsm material which is lightweight, comfortable, a dream to wash and dry, and which offers protection against the sun. The fabric offers UPX50+ solar protection to prevent the sun’s rays from penetrating through to your skin (the Vapor Apparel Solar range has received The USA Skin Cancer Foundation Seal of Recommendation. Another addition is a Vapor bandana which is manufactured from the same fabric as the popular Vapor Basic range of t-shirts. Finally we have also added dog bandanas, available in four sizes, which are also manufactured from the same fabric as the popular Vapor Basic range of t-shirts. 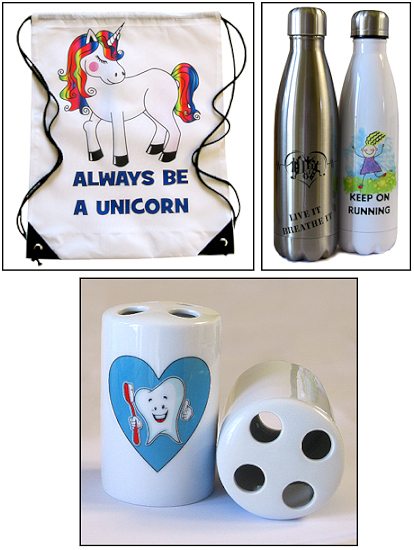 All the above products are for dye sublimation printing. 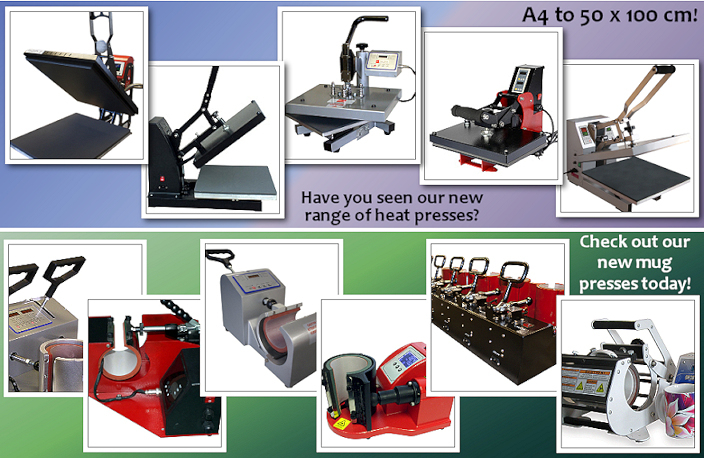 We’re delighted to announce that we’re now distributing Adkins heat presses for the first time.We have the Basic and Studio ranges available and illustrated on our website, offering a range of flat presses and mug presses to suit every user from the hobby market up to the full scale commercial users. We also offer, for the first time, the Alpha range of large format printers up to the 120 x 170 cm twin table models. We’re also delighted to announce that we can now offer finance deals on any equipment-based package from £1000 + VAT upwards to limited companies, and we’ll shortly be able to offer finance to non-limited entities including schools and charities! New later cut off time for orders! Our rural location down here in sunny Devon has always meant that we’ve had to have a fairly early cut-off time for next day deliveries – however some changes to our systems and the co-operation of Fed-Ex means we’re now able to offer same-day despatch guaranteed on any order for in-stock items placed by 2.30 pm although of course we’ll do our best to despatch same day even if you miss that deadline!